It’s totally normal (I’m sure you would agree) to collect books like American School and University, and as I was flipping through the 1950-51 (22nd annual) edition, I came across a chapter called “America’s Outstanding School Buildings (built since 1945).” In that chapter was a series of school photos and a longer listing of “best” schools in each state. 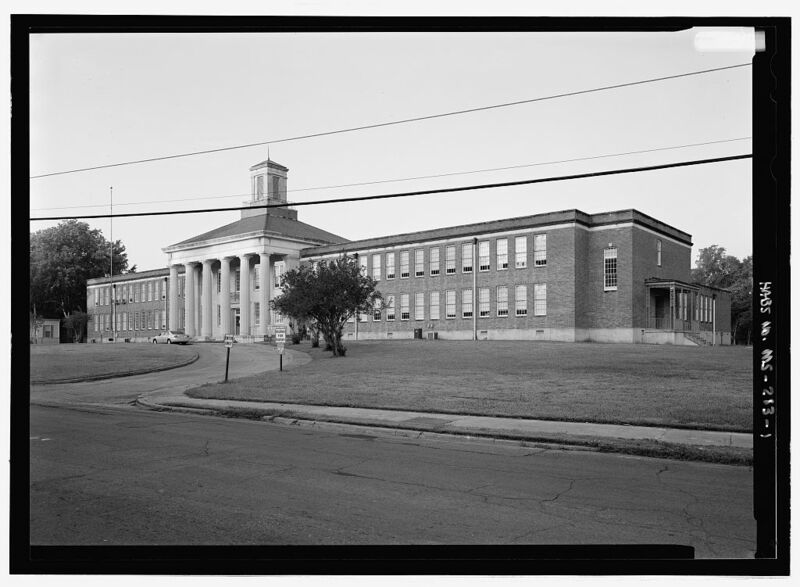 This is a period of school building that’s very important in Mississippi’s history, as it was around the time of Brown v. Board of Education and there was an attempt to “equalize” the schools for black and white students in order to preserve segregation. As you may recall from the News Roundup a week ago, the equalization period was the same one in which the Liberty Elementary School was built. Anyway, the list for Mississippi really gives us a perspective on what the “experts” of the time thought about individual schools. The buildings were chosen based on such criteria as number of stories (one story was the ideal), acoustics, lighting, sturdy materials (i.e. not Dryvet), and special facilities such as health clinics or multi-use areas. There’s no mention of “modern style” or anything like that, and in fact, look at the difference below between the two pictured schools–one very modern, one trying to look like an old Natchez mansion. Be prepared to not know what these buildings look like–they’re not the familiar landmark schools we’ve all come to know and preserve. But maybe we ought to give the buildings on this list (the ones that are still standing and intact, that is) a second look–not only for their architectural merit but also considering their important historic context. Neat! I’ve been thinking about schools from this period a lot lately (and fire stations and other municipal, etc. buildings), but I don’t get out of Jackson very often so it’s really cool to hear about these things in other places in the state. I’m very curious, though, why none of the new-at-the-time Jackson schools made it onto that list. I love that Braden school; very playful that center traditional element on the long modern box. Ayn Rand would have hated it; good going, Mr. Naef! Yes, Ayn Rand would have written a long diatribe about Braden, wouldn’t she? I think it may be “Early Post-Modern” which would make ol’ R.W. a very forward-thinking guy. I think he was one of our better 20th-century classicists, esp. looking at his Ole Miss dormitories, but this one does make me wonder if he was pulling one over on the Natchez garden clubs. As for Jackson schools not being present in the list, I wondered that myself. 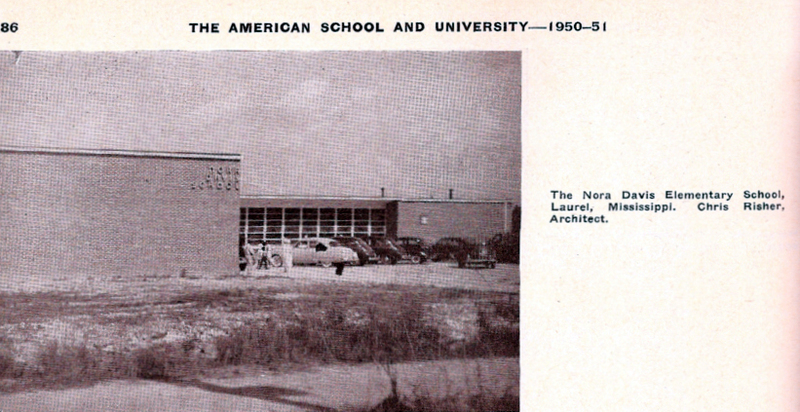 We did have a number of schools built between 1945 and the publication of this book in 1950/51, including of course, the Schools for the Blind and the Deaf, Boyd School on Northside Drive, and Bradley Elem off of Medgar Evers (an Overstreet that was designated a Mississippi Landmark last year). But the bulk of Jackson’s schools of the period were built beginning in 1950 and 1951 (Lester, French, Isable, etc.) and probably wouldn’t have shown up here because they weren’t quite done yet. Regardless, I would definitely have added Bradley to that list if I had been around to make the list. I attend W H Braden Elm. Early 60’s. I remember the entire school called to the Auditourium. We were told about JFK’s Death!!! 5TH and 6Th Grades.